To view the current status of live video broadcasts being sent from WebCam Monitor, click View >> Who is viewing Broadcast. 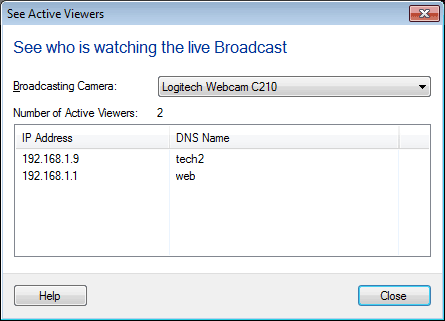 The See Active Viewers dialog displays a list of cameras that are currently broadcasting, and the number of active viewers for the selected camera and details of connected clients who are viewing the broadcast. The details include IP Address and DNS Name of the client.